Add 1/2C bread crumbs and crab. Taking a rubber spatula gently fold mixture together until blended. Shape into patties and chill, covered, for at least 1 hour before cooking. Can be pan fried in crisco (best) or baked in over at 350° until well browned. There is also a way to make these without using any crab. The idea probably came about in areas where crab was expensive or during the depression when it was unaffordable for poor families. 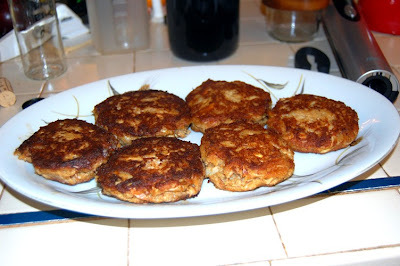 Click the link Facebook) for Mock Maryland Crab Cakes. If you're looking for inexpensive crab meat try Costco or BJ's. 1) Can be found in most stores, I couldn't find a good online vendor.